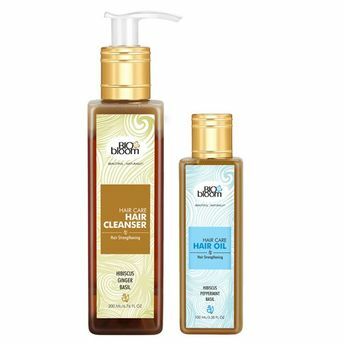 Biobloom's Hair Strengthening Solution kit contains 1 Hair Strengthening Cleanser (200 ml) & 1 Hair Strengthening Oil (100 ml).It gives you stronger, healthier and lustrous hair with regular usage. Made with Ginger Juice, Basil Extract, Hibiscus Extract, Peppermint and Almond & Coconut Oils, Biobloom Hair Strengthening Cleanser helps improve blood circulation and provides nourishment to weak hair. This Shampoo is 100% Sulfate-Free (NO SLS/ SLES) and Paraben-Free. It cleans effectively and nourishes your hair from root to tip, making them shine with all their health. Enriched with the goodness of Basil, Hibiscus & Peppermint essential oils, this Biobloom Hair Strengthening Oil is free from Petrochemicals (NO LLP) and provides nutrition to hair, making them stronger and prevents hair fall. Additional Information: Beauty goodies born from the magic of nature's heart, BioBloom is an endeavor to give you organic ways to provide the best your body deserves. This lovable brand comes with a line of lotions, oils, mists and more to attain a healthy and rejuvenated body, mind and soul. Overloaded with abundant care for your skin and hair, BioBloom is everything you need for a gorgeous boost to all your fabulous beauty regimes.